In English Section, it was seen that there is an exorbitant change in the pattern since, last few years. Many of you intimidate while attempting this section. English section is arduous for every student so it is required to have a right tactic to solve this section. English section is entirely based on the rules of grammar.Here Mahendraguru provides a Digi page of English section on the daily basis so that you can learn from basics to advance level of English language based on the latest pattern. You can also study and learn the basics of English and practice more questions through our E-Mahendra Facebook and Mahendra guru YouTube channel which provides a free online study for student and you can also attempt mock tests through our Mahendraguru app.English quizzes are provided on day to day basis so that you can practice a lot and prepare yourself for an exam. 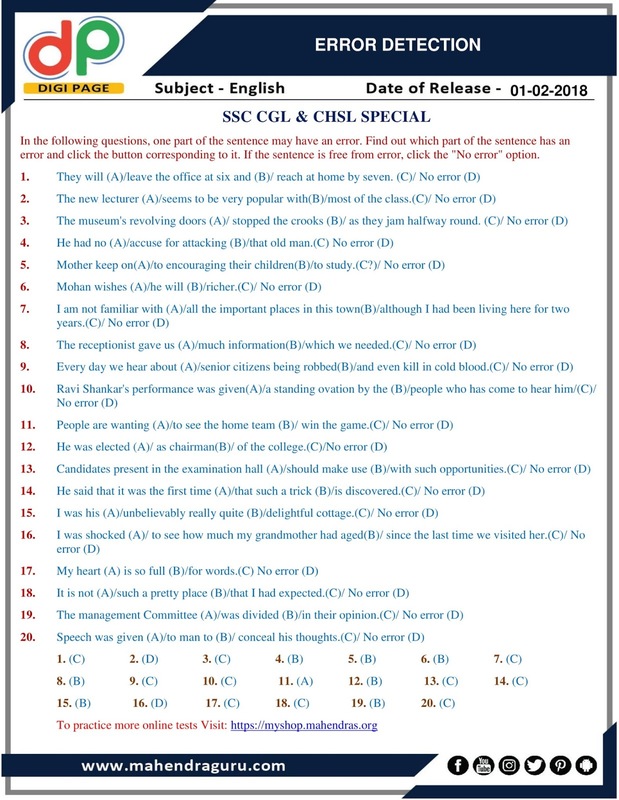 English is a scoring section for every exam and helps you to crack the exam if you are aiming for government jobs like IBPS Clerk , SBI Clerk, IBPS SO, RBI Assistant Exam, SSC CHSL and CGL, Insurance exam & other competitive exams.